Built by Stalin as emblems of victory and symbols of a new era, the seven colossal skyscrapers still stand out amid new high-rises. From time to time, the Soviet man, raised in the spirit of atheism, needed messages from on high. Fortunately, he had the inspirational Pioneer camp Artek in the Crimea, the Exhibition of Economic Achievements in Moscow, and the famous Moscow Metro — heralds of the communist paradise on earth, which would arrive one fine day, despite all the burdens of grey socialist work days. Soon after the end of World War II, in defiance of all doubters, a grandiose new architectural project was launched. Joseph Stalin, “the father and friend of all Soviet architects” as he was called at their All-Union Congress in 1946, embarked on a colossal construction project designed to convince the Soviet people and the whole world of the victorious Soviet power’s increased self-awareness. In early 1947, the Council of Ministers adopted a resolution for the construction of seven “skyscrapers”. On September 7, that same year, during the celebration of Moscow’s 800th anniversary, at exactly 1:00 pm, the first stone was laid in a special ceremony. 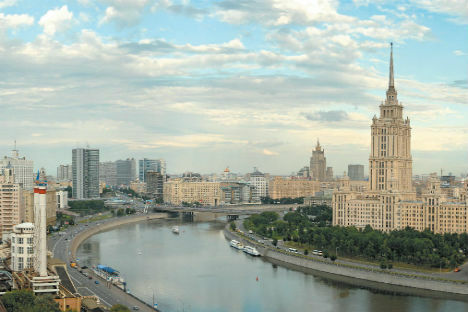 The first Moscow skyscraper was completed in 1949, followed every three-five years by another (all but one of the remaining six). Later known as the “seven sisters”, these buildings became famous as monuments of “Stalinist-Gothic” and the defining symbols of Moscow: Moscow State University (240 m.) on Sparrow Hills remained the tallest building in Europe until completion of the Exhibition Center at Frankfurt-on-Main in 1990; the Foreign Ministry; the Ministry of Transportation; two residential buildings; the Hotel Ukraine; and the youngest of the sisters, the Hotel Leningrad (135 m.). In the post-war period, these symbols of a new era, glowing with magnificence, seemed like fantastic emblems of triumph and beacons of a resurgent country proclaiming its greatness to the world. “We can!” That was their architectural slogan, trumpeted from a country that lay in ruins, a country faint from hunger, a country most of whose residents still had to live in cramped communal apartments. The supervision of the skyscrapers’ construction was initially entrusted to the notorious KGB chief Lavrenty Beria (who would be executed in 1953). Beria was also in-charge of creating a Soviet atomic bomb. Thousands of prisoners from the Gulag and German prisoners of war helped in constructing these towering high-rises. A different technique was used for every building to stabilise the ground under the foundation. The costs didn’t matter. Around 2.6 billion Soviet rubles were spent on Moscow State University alone. At current exchange rates, it would amount to around $650 million, more than two billion rubles set aside to rebuild the war-ravaged Stalingrad from 1946 to 1950. Roughly the same amount was spent on the construction of the other six “sisters”. 206 meters is the height of the Ukraina hotel, including the 73-meter-long spire. The total area building is more than 88 thousand square meters. These monumental skyscrapers built in the style of neoclassicism surround the center of the city like a fortress wall. All were built according to one stylistic conception: a dominating central tower which, like an Aztec pyramid, narrows in stair-like stages to the top, and is flanked, in a more or less strict order, by wings. The plan of the buildings may vary, as may the lavish decorations of the towers, the statues and bas-reliefs. Each skyscraper represents a set of architectural quotations and borrowings from various styles and tendencies, from the Renaissance and baroque to Russian church architecture. Clearly, Stalin’s tastes, known for his preference for Gothic, loomed large in the minds of architects. They didn’t always manage to please him: the Foreign Ministry was not originally designed with a spire, but the dictator insisted. So as not to violate the building’s statics, a special light-weight construction had to be perched on top with supports descending five floors made the same color as the skyscraper. After Stalin’s death in 1953, the architects asked the new General Secretary, Nikita Khrushchev, for permission to undo this Stalinist act of despotism. But Khrushchev refused. He wanted the spire on the Foreign Ministry to remain as a “monument to Stalin’s stupidity”. 1200 paintings hung on the walls of the corridors, halls and rooms. The most famous are by Vasily Polenov and Alexan- der Deineka. Contemporaries were immediately struck by the resemblance of these Stalinist-Gothic monuments to certain American precursors, such as the Manhattan Municipal Building completed in 1914. Given this resemblance, it was hard to make the necessary ideological case. A dialectical explanation was required here: capitalist temples of trade were studied in detail and used as a foundation, the object being to give them a completely new meaning. The shape of the Municipal Building in New York City was determined by the high price of land; this in turn deprived many of the apartments of natural daylight since they face a dark inner courtyard. Needless to say, the Soviet man, standing at the head of all city-planning projects, deserved better. Stalin’s death marked an end to the principle that “the eye should delight” as quickly as the “father and friend of all architects” had disposed of the Soviet avant-garde in the 1930s. Khrushchev declared war on Stalinist extremes in city planning. Now everything would be sacrificed to functional understatement. Rapid construction of mass housing had begun, leading to many city dwellers getting separate apartments for the first time in their lives. In the Russian mind, however, Stalinist skyscrapers still equal quality, while Khrushchev’s matchbox-size apartments equal quantity. Today, the “seven sisters” have somewhat lost their old lustre. In the two residential buildings the elevator breaks from time to time while the residents, members of the intelligentsia in the first case, pilots and cosmonauts in the second, must make their peace with the fact that their new neighbors are hardly high society. The central building at Moscow State University with its marble staircases and rich interior furnishings and special aura remains very grand, but many of the rooms in the dormitory badly need repair.